To many the Roman Forum may just look like a huge field littered with rocks, but you have to remember that this once was the focal point of an empire that lasted a thousand years. Entrance to the Forum used to be free, but is now included in the ticket for the Colosseum and the Palantine Hill. The Forum was layed out along side the Via Sacra, which leads from the Colosseum to Capitol Hill. In the Forum you will find the Arch of Titus, that was erected after the victory of the Romans over the Jews during the sack of Jerusalem. It was built by Jewish slaves as a humilation. For ages Jews refused to walk underneath this arch. Until 1948, when the country of Israel was created after world war II. It is said that the Arch of Titus is the arch on which many other Arches, including the Arc de Triompfe in Paris are modeled. The Basilica of Maxentius and Constantine was the biggest structure in the Forum, and one that was added quite late. The built was started under Emperor Maxentius in 308. After he was defeated by Constantine at the battle of the Milvian Bridge it was finished by Constantine in 312. At this moment only the northern wall of the church still stands, considering that this is only one of the two side naves, give you an impression on how huge this Basilica must have been. Opposite the north wall you will find the foundations of the south wall. 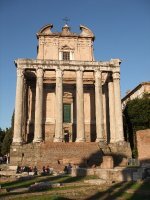 The Temple of Antoninus and Faustina is an ancient Roman temple which was adapted to the church of San Lorenzo in Miranda, which means that most of the structure is still standing however changed quite a lot during the years. The temple was erected in 141 A.D. and dedicated to Empress Faustina. After the death of Emperor Antonius this temple was also dedicated to him. In the main square you will find a small temple, that now looks more like a busstop with a cover on top. This is the Temple of Julius Caesar. It was placed here by Augustus on the place where Caesar was cremated. The temple was erected in 29 BC. Until today people lay flowers on this spot. 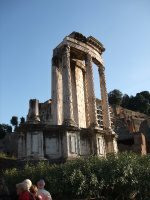 Nearby the three tall colums belong to the temple of Caster and Pollux. It was originally built in gratitude for victory at the battle of Lake Regillus (495 BC). Castor and Pollux (Greek Polydeuces) were the Dioscuri, the "twins" of Gemini, the twin sons of Zeus (Jupiter) and Leda. On the right behind the temple of Julius Caesar is the small round Temple of Vesta. This is were the sacred fire of Rome was kept buring by the Vestal virgins that lived in a house near the temple. The virgins were chosen at the age of 6, and needed to serve for 30 years. They spent the first 10 years training for their later tasks. After that they spent the next 10 years of service. Besides keeping the flame of the sacred fire burning, they appeared at ceremonies and festivals. The virgins also had special seats of honour at the Colosseum. The last 10 years of their service were spent in teaching the new generation. The Cult of Vesta left the Forum, when in the 4th century all non-Christian religions were outlawed. Of the house of the Vestal Virgins you can still see the outlines, and the two pools that belonged to the house. After 30 years of service many virgins chose to stay at the house. The Curia or Senate house was the oldest political building of the Forum. It has been rebuilt several times. This is the place where the senate ruled the republic for 500 years, but it also kept active during the age of the Empire. The building still stands because it was used as a church for many years. In 1937 the Curia was restored to the way it looked under Emperor Diocletian. The orginal doors of the Curia were used by Borromini for the Basilica di San Giovanni in Laterno. 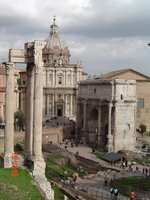 Close to the Curia and at the end of the Via Saccra stands the Arch of Septimius Severus. It was built in 203 A.D. after the victory over the Parthians. (who lived in what we now call Iran.) The central panel on the arch, depicts the Parthians being led away in chains. 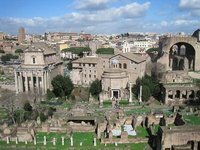 The Rostrum is a huge stage that stands not far from the Curia it was used as the place were politians and emperors spoke to the people. In front of the Rostrum is the last monument to be added to the Roman Forum, which was the Column of Phocas a gift from the Emperor Phocas, who ruled the Eastern Empire. Behind the Rostrum stood the Temple of Saturn, now we only see the 8 remaining columns that stood on the entrance of the temple. This temple held the treasury of Rome. The treasury was later moved to the Tabularium, which is now beneath the Capitoline museums. From the forum you can see the arches that belong to the Tabularium. If you pay a visit to the Capitoline Museum you can visit it, and also see the fundations of the Temple of Jupiter that stood on Capitoline Hill. The entrance to the Roman Forum used to be free, and you will still find it listed as free in many of the guidebooks, but a visit to the Roman Forum is now included in the combined ticket for the Colosseum and Palantine Hill. It also means that if you buy a ticket at the Forum, you can skip the long lines at the Colosseum. For an adult the costs are €12 for a combined ticket. Next to the Colosseum you will find the Metrostop with the same name. Coming from the Metro, you pass the Colosseum on your left, and pass the Arch of Constantine, You will find the entrance of the Roman Forum (and Palantine Hill) to your right. This is version 15. Last edited at 15:37 on May 23, 10 by Herr Bert. 5 articles link to this page.